In another 'retaliation' statement against Religious Zionist parties, Aryeh Deri hails Herzog as PM at Opposition meeting. Shas Chairman Aryeh Deri declared support for Opposition leader Yitzhak Herzog (Labor) for Prime Minister Tuesday, continuing a string of comments supporting the Opposition in apparent "revenge" against the religious Zionist community. "I was asked if Herzog is an appropriate candidate for Prime Minister - and the answer is yes," Deri stated on Tuesday, eliciting applause from the convention of Opposition members. The Opposition announced Monday that it would be holding "alternate" meetings, boycotting the government's vote on three essential laws - the Governance Law, the Referendum Law, and the Equal Burden of Service Law. "It's too bad we haven't crowned him [Herzog] as Prime Minister," he added. 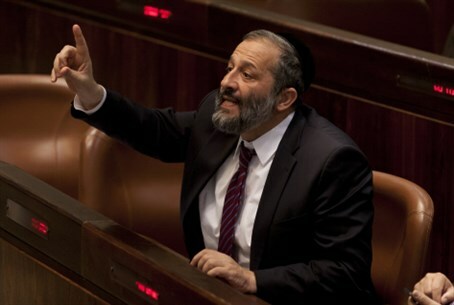 Deri hinted that his constituency may take revenge on the religious Zionist movement for the hareidi enlistment law on Monday. He attacked Jewish Home Chairman Naftali Bennett, who initiated the Referendum Law and who has threatened to leave the Coalition to prevent withdrawals, hinting that Bennett's moves may have turned the hareidi public against the religious Zionist public in terms of land withdrawals. "Those who want the National Referendum Law in order to have a cover for staying in the government even during peace talks, should understand that the result of a referendum after the treason, after they sold the hareidi public to achieve their goals; they should know that they won't necessarily get the hareidi public in a referendum, possibly the opposite," warned Deri. Hareidi MKs have repeatedly vowed "revenge" on the religious Zionist community following the draft edict, which is being spearheaded by Finance Minister Yair Lapid (Yesh Atid) but also backed by Jewish Home. Hareidi leaders have compared the backlash against the draft to resistance against Nazi Germany, political uprisings in the Ukraine, a "fight to the death" for Torah values, and the struggle against the ancient Persians in the Purim story. At least one Hassidic sect has threatened to flee Israel en masse if the draft law is ratified, and a boycott has even been threatened against Judea and Samaria in "retaliation" against the Religious Zionist community for the measure.